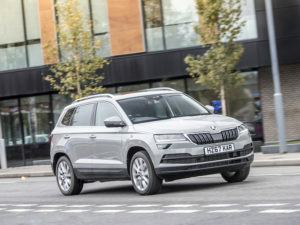 Skoda’s Yeti-replacing Karoq midsize crossover is now available in an SE Technology variant designed specifically for fleet drivers. The new Karoq SE Technology brings a P11D from £20,660, BiK from 22% and CO2 from 117g/km. Priced exactly the same as the SE with a P11D from £20,660 (OTR from £20,875), the new model joins the SE Technology variants already available for the Octavia, Superb and the Kodiaq large SUV and brings equipment including front and rear parking sensors, panoramic sunroof, LED daytime running lights, wireless phone charging and adaptive cruise control, as well as sat nav with 8-inch touchscreen display with European mapping, voice control and integrated Wi-Fi and a one-year subscription to Infotainment Online. Four engine options – two petrol and two diesel – are on offer with power outputs ranging from 113bhp to 148bhp. All four are available with seven-speed DSG transmission as an option, and the 2.0 TDI diesel engine is available with four-wheel drive. CO2 starts from 117g/km with BiK from 22%.